Horrible Adorables x Kidrobot are about to reunite for 2018! Last year we saw plenty of vinyl releases from Horrible Adorables x Kidrobot and this year Horrible Adorables are next inline to have taken Kidrobot’s licenced Care Bears and given them the Horrible Adorables treatment! 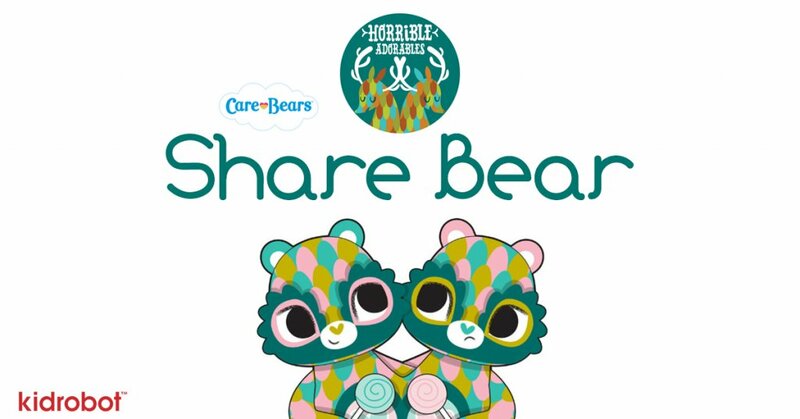 Like they say “sharing is truly caring” Horrible Adorables x Kidrobot present to you “Share Bear” Once again we are breaking the rules to bring you another leak, see what we do for you guys. These are just vector images so stay tuned for actual images of Share Bear. Medium size vinyl release should be around the 4″-5″ mark. As much as I love Horrible Adorables I personally feel like I would at least love to see one piece of wool felt, incorporated into a vinyl release. Dunno if it’s just a Monday thought, I mean I love the design but not having Horrible Adorables wool felt losses a little spark for me. Cannot wait for them come out? why not head to Horrible Adorables Etsy STORE and feast your eyes on their fab work. If you want to get your Designer Toy news first, you should look to download our new TTC Mobile App. Designer Toy news direct to your smartphone. No dealing with social media algorithms. You can find Jordan Elise – Horrible Adorables at their Facebook , Instagram, Etsy shop .